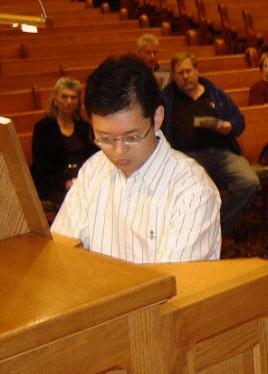 Organist-Choir Director Aaron Tan greets the group at the First Presbyterian Church of Ypsilanti. 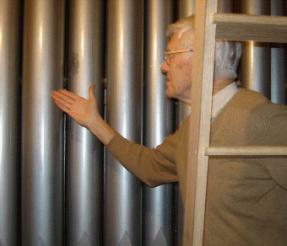 Jin Wilkes points out the fine workmanship of the Martin Ott pipe organ. 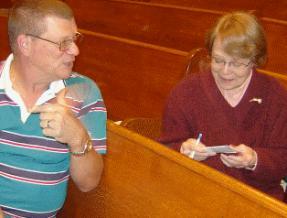 Diane Hiltner happily provides a dues-paid membership card to John Keeber. A five-way discussion ensues between (l-r) Ed Price, John Keeber, Eric Wadke, Henry Aldridge and Steven Ball. 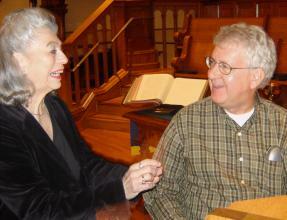 MaryAnn Balduf and Ed Price share a happy moment at the Martin Ott pipe organ. Steven Ball seems to be plotting a bit of musical intrigue with Jim Wilkes. 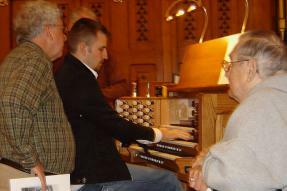 Ed Price, Steven Ball and Jerrell Frederick pay strict attention to the Martin Ott organ console. 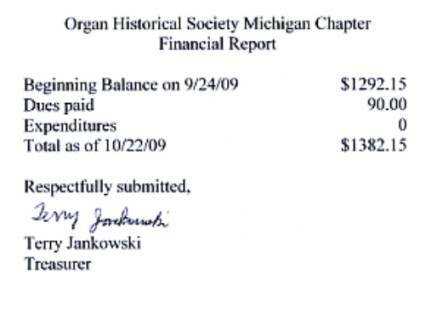 The October 2009 meeting of the Michigan Chapter of the Organ Historical Society convened at the First Presbyterian Church of Ypsilanti, Present were Henry Aldridge, Carl Balduf, MaryAnn Balduf, Steven Ball, Marshall Dicks, Leonard Feerick, Jerrell Frederick, Diane Hiltner, Dana Hull, John Keeber, David Noel, Jasper Pennington, Edward Price, Eric Wadke and Jim Wilkes. 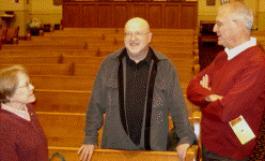 The meeting was graciously hosted by Aaron Tan, First Presbyterian Church, Ypsilanti, Organist and Choir Director. Carl Balduf called the meeting to order at approximately 9:40 a.m., at which time the minutes were approved as printed on the Web site and distributed in hard copy at the meeting. The Treasurer's report was then read by Balduf in the absence of treasurer Terry Jankowski. The report can be found below. Old business: Diane Hiltner stated that she had received only seven membership renewals for the 2009-2010 year. She suggested that her name and address again be posted in the next e-mail notification. No other old business was discussed at the meeting. New Business: Balduf asked the meeting to approve an expenditure of $195 to establish a dedicated OHS Michigan Chapter Web site, because the size of the current OHS Michigan site is costing his CaBalettA .com site additional expanse. After brief discussion, the expenditure was approved. 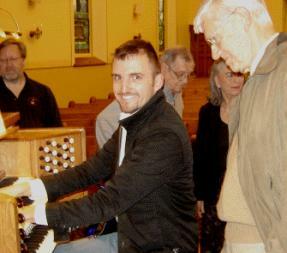 Aaron Tan then introduced the new Martin Ott pipe organ and deftly demonstrated its broad tonal capabilities (Listen) This was followed with an open console, advantage of which was taken by a number of organists present. This was followed by lunch at Haab's Restaurant in Ypsilanti. Lunch at Haab's Restaurant was well attended by (l-r) Diane Hiltner, Henry Aldridge, Aaron Tan, MaryAnn Balduf, Dana Hull, Jerrell Frederick, John Keeber, Carl Balduf, Leonard Feerick, Ed Price and Marshall Dicks. The Rev. Jasper Pennington, Chapter Chaplain (not pictured) gave the blessing. Diane Hiltner, Jasper Pennington and Henry Aldridge enjoy some good conversation.